In this timeless classic, Walter meets a lovely painter whom he falls in love with. This leads him to stumble across many strange and peculiar occurances, including the meeting of mysterious Count Fosco. This character was on of my favourites. He was very captivating and had many unusual qualities that just enticed me to discover more about him. There were many twists surrounding him and I found him to be quite humerous although slightly creepy! 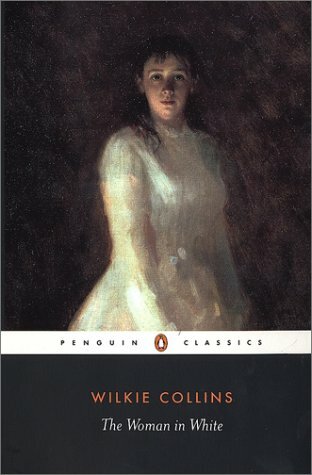 Due to the classical form of the novel, written in the 19th century, I was expecting it to be quite slow and dull with lots of detail, as a stereotypical classic would portray. This was quite different however in that there were a lot more twists than I expected, which was a pleasant surprise. At many times I was eager to read on and was unsure of what was going to happen next, making reading very enjoyable. The 'woman in white' was an intriguing concept and from her first appearance in the beginning I was hooked to discover more about her. This is a fantastically gothic theme of the novel and worked really well to add depth. Altogether this was a wonderfully mysterious novel with many gothic elements and twists in the story line similar to the what we see today in modern novels. The characters were so imaginative and creative, really well written and I loved seeing their development. I would certainly recommend this to lovers of classic novels as well as those who are intrigued by works that created the mystery and twists evident in today's fiction.